On April 5, I was happily in the basement of the Zeta Psi house in New Haven, learning a new drinking game. I lost. No more of that for me! I realized today that this site was down- I don't know how long it had been so. But it's up again, and I thought to mention I will be in New Haven April 4-7, should anyone be around. Time and memory have brought us this 15 year anniversary of the end of our time with Matt, and of the beginning of a different kind of being with him. I lived half the continent away, and only saw Matt in person over the last 20 years of his life when I made a trip back east. But I could always call him, and knew he was a short 24-hour drive away. I do miss that option. Which reminds me - Bob Englander moved here over a year ago and I have seen him like twice. Note to self... carpe diem! Thank you to Nan. She always remembers to care for Matt's friends, as she does for Matt. Thanks to Chief Bowen for this picture at the HY tailgate last year. Click through the icon to see the full-size version. That's Larry, Victor, Ken and me flanking Cathy and Catie, both demonstrationg classic Sorority Squat form. Priceless! DK's flag got eclipsed by Matt, so come tailgate in 2019 and see it for yourself. We are sore following the glorious victory yesterday. I'll post the pictures of the flags when someone sends them to me. So will someone do that, please? I am in New Haven for the Game, with my daughter Catie, Pat Signorelli, Larry Pradell and Ken Bowen. I missed Victor & Cathy Alfandre today, but will see them tomorrow. I also missed seeing Dan Stratton but will catch him iin NYC later. I'm staying until after Thanksgiving. The Class of 1981 Consortium Tailgate continues. Look for dual flags - of Matt and Dennis. We'll be in the same spot, hopefully by 8 AM. I hear there is no more D Special, it's all just D now. 14 years now. I miss Matt, and I miss you all, scattered as you are now across the globe. I hope you are all well. I remembered that I do have some news that might interest Yalies of about my age - Bob Englander, JE '83 and fellow Spizzwink(?) - yes, that's how we spell it, with a question mark - has moved to Minneapolis, so when Stratton visits, we are one Wink shy of a quartet. Geez, I am late for Matt's birthday again. I have no news to pass on since reunion, as I haven't traveled much and I haven't heard news from others. In local news, I have bought the other half of my marina, so I am not retiring anytime soon. This weekend was the 35th reunion of the Yale class of 1981, to which Matt and I titularly belong. Matt probably would have attended, because his friends would be there. For me one of the most poignant memories was when we were passing the list of names to read the names and honor each classmate, it came to Kenny Bowen to read the name of "Matt Hawley". In the randomness, there was a guidance that seemed not so random. Kenny and Matt were close friends and Kenny felt the unseen hand as the name he was to read was his beloved friend. Of all the people there, Ken and Dan are the two I get to see every year or so when they come to town. In addition to Nan Hawley, '76, I heard from Dan Stratton '81 and Federico Menelli '81 that they are going to reunion. Nobody else yet. It's Steve Farr's birthday. Happy birthday, Steve. I was emailed in August by a fellow named Mat Hawley, who wondered who was this Matt Hawley, our friend? I wrote and told him, but didn't hear back. Other than that, I haven't gotten any news, photos or thoughts from anyone for awhile. I toured Westminster Abbey in London 10 years ago, and noticed that the constant foot traffic had greatly worn the memorial stones underfoot. I asked our clergyman guide whether he was concerned that they would be ruined. He was not, he replied, because "Everything has a life." I think I may end this website this year. It doesn't mean I won't think of Matt. I just won't put it on the internet. Oh, my! Nan Hawley emailed me just after I posted the above and asked how to save the website. I was writing her about the Wayback Machine archive (https://archive.org/web/), so I thought I would go see if this website was really archived. It was, and also archived were at least some of the dozens of pictures I lost when Registerfly went dark a decade ago. I have some work to do! Nan asks, Is anyone planning on going to the reunions this year? It's 40 for her, ands 35 for the class of '81. March 5 - I got a whole bunch of pictures back. Not all, though. Even the internet forgets sometimes, I guess. I'm back from a quick trip to Philadelphia, where Larry Pradell was kind enough to show us the best of Philly BBQ and New Orleans cuisine. Yup, I got a cheesesteak, too. Thanks, Larry! I tentatively declare victory over the hackers. Now I am paranoid about Wordpress insecurities. Stupid hackers. All this destruction to sell bogus diet pills. The Harvard football game is in New Haven, so I suppose there will be a tailgate. If anyone has news to share of that, please send it on. Sadly, I doubt I can make it this year. I think this will be the first home Harvard game I won't attend. I can't believe it! I did it again - even though I queued up the update a day before. But then I forgot to make it live. I even had a self-congratulatory note in there. I deleted it now, as it's undeserved. Shoot. No fancy WP site yet, but this should be the last installment in the tired old Pagemill format. Maybe I'll revive the blog for visitor comments. I hope you are all well, and springtime comes to you as soon as you are ready. I suspect for most, that is very soon. Warning: This old man is getting jiggy with the internet again. My switch to a different server & OS brought this page down for a couple days, but we are back up with no data loss & ready to convert to a WordPress page. Just as soon as I learn Wordpress. Once again I have missed my deadline. March 2 came, and then it went, and I just forgot to go update the page. Sorry, all. So there's no hot news to tell. The Class of 1981 Consortium tailgate at the Harvard game was large but largely in control. Except for our location in D Special, we have become one of those tailgates that we used to consider lavish. I'll be in New Haven April 3-6 if anyone is free to get together. Addendum: I found myself in New Haven on April 5, the anniversary of Matt's death. With me was Dan Stratton, Matt's freshman roommate in Vanderbilt. We put up a toast to Matt. Then I got a call today, April 15, from David Steinberg. It was good to catch up with David again. 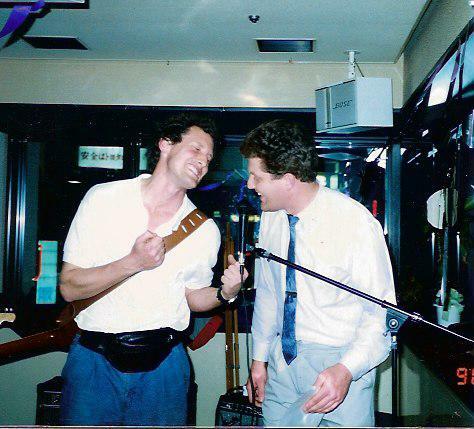 A friend of Dennis Kammerer's in Japan, Kevin Odlozil, wrote me yesterday. That remended me that I had missed Matt's birthday for what is probably the 35th year in a row. I always told him "Happy Birthday" on the 2nd - I just coudn't get it right. I am a little later this time. But, "Happy Birthday, Matt". Anyway, Kevin is missing Dennis. I, and probably you, are missing Dennis and Matt and Cindy and Catherine and many more. And we're thankful for the time we had with them. If you are planning to be in New Haven for the Game, please join us at the "Class of 1981 Consortium" tailgate. I always think of it as Matt's tailgate because he did most of the work. If you're not planning on it, perhaps you should. I'll put details up here as they become available. Shoot. Thanks to a timely Facebook befriending by Tina Ingmann (thanks, Tina!) I realized that I missed updating this page on Matt's birthday last Thursday. I decided a couple of years ago that his birth was a better thing to celebrate than his death. It's ten years now since that latest of Matt's parties, and it still feels so recent. We miss you, Matt. And... I have very little news to share. If I get some, I will append that here. If you haven't visited for a while, please read below for the news that Dennis Kammerer has also left us to wander elsewhere. Dennis's spirit passed into the next realm a week ago on 10 July 2011. He died at home. We (his family) buried him 2 days ago, Saturday, 16 July 2011. Dennis was a unique individual with many positive gifts which he shared with many people. He was loved by his family and he will be missed by many. Indeed. I thought that Matt wouldn't mind if Dennis got a little face time. This picture from Marty is just what I wanted to see. Thank you so much, Marty. There's a little "reply-to-all" email list circulating of our memories of the time when we were all young, strong, good-looking and immortal. If you would like to be included or have something you'd like me to put up here, just email me here. I am earlier than most years, becuse of Martin Weatherby (Yale '85). Marty is a Friend of Matt who teaches in Japan, and he somehow found me on Linkedin. (Linkedin is just as good as Facebook for collecting lost friends, and doesn't have those stupid games.) Marty's connection reminded me to get moving on an update, a couple days before my calendar alarm went off. I had written before that I decided to update this page each year on Matt's birthday (3/1) instead of the anniversary of his death (4/5). Sadly, I have little news from friends. Perhaps they are on the old schedule. Dennis Kammerer back in the USA, last known in Chicago. Steve Farr is happy in Annapolis. Larry Pradell is setting a bad example for his patients by gorging on fatty BBQ pork ribs. Send more news! And if you have some of the lost pictures (see links below) or new ones, please send them on. I have been upbraided by Larry Pradell for not properly advertising that I have opened a bar. A real bar, not like the one we have at www.alleypub.org. In March, I bought a marina on the Mississippi and there is a bar and restaurant there. http://www.TheHiddenHarbor.com. FWIW. Greetings from balmy Minnesota. Seven years has flown by. I have no news form other folks to share, sorry. So I am left with current events. Who cares about Harvard? The Bulldogs bounced the North Dakota Sioux out of the NCAA bracket before being outscored 9-7 by Boston College. In a rare year when the Gopher were loafers, Yale came through to punish the hateful Susies.This is the sort of stuff we petty old men relish. In the changeover from server to servers, I've lost some pictures. If you can, send them to me & I will post them. I got an email from Nan today. That prompted me to post up earlier than I would have, since today is Matt's birthday. Happy Birthday, Matt. 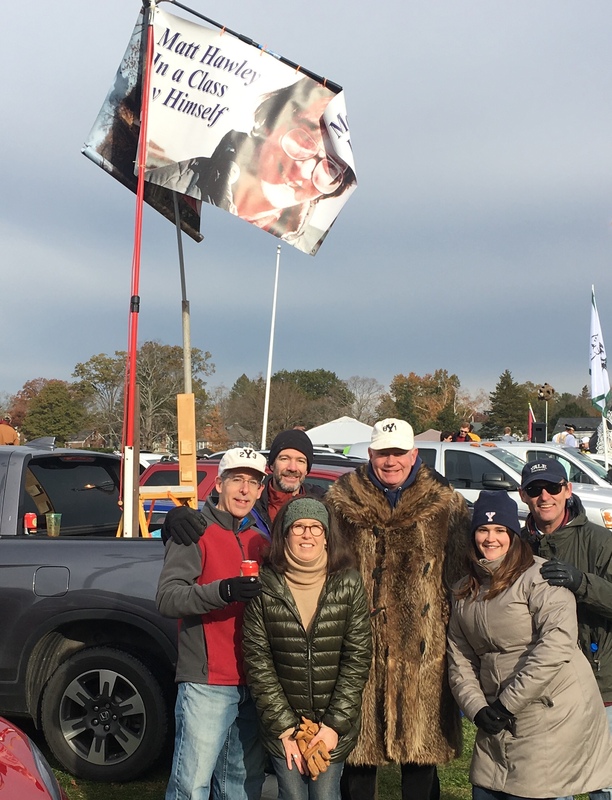 Last November, the Class of '81 Consortium tailgate once again came off in New Haven for a home game against Harvard and the flag flew again. I am sorry to report we now have one more reason to hate Harvard. I'm late posting to the website this year. I was travelling and I didn't take my laptop. When the alarm popped up on my phone calendar that it was time to post, I was surprised and a bit embarrassed. I was in New Haven. That was a little weird. I sometimes wonder if it matters if I post at all, or if I'm just doing this as an odd exercise. I suppose it doesn't matter. This is as close to blogging as I get, even if it is just an annual twitter. I was able to thank John Rogers for arranging the Berkeley dining hall for Matt's memorial service on short notice. John isn't Master of Berkeley College anymore, but he's still teaching at Yale. So now it's 5 years today since my best friend went away. And, you know what, it doesn't make me so sad to think of him anymore. I still think of Matt as often as I always did, but I realized not too many days ago that I think of him more as I did when he was alive. OK, I'm sad again right now, but it'll pass. When an old memory finds its way to me, or a "Matt-ism" unexpectedly slips out of my mouth, it's kind of like he's here again. I hope you are able to remember him happily, too. About the website: I will keep it here for a good long while. I was going to be fancy and get a blog attached, but I decided to transfer it to some other space I have and forego both the blog and the ads that would come with it. Ads just didn't seems right. I often wish I lived closer to many of you, so that I could see you more often. I will do my best to come see you. Should you come my way, please plan a stop. Until then, keep partying on. Anybody up for some football?? Where else is there an opportunity to see Harvardians get crushed in the Bowl? Or to see Alums wet themselves, with beer and other bodily fluids, on the sacred ground of Lot D Special? Once again, it is that time of year to to order football tickets, reserve hotel rooms and tailgate food and get parking passes. The fall is here, and the smell of Cantabs is in the air. I am looking for a preliminary head count to gauge food requirements for a tailgate. Facts: Game is at Noon, Nov 17th at the Bowl. Hotel: The Residence Inn at Long Wharf has been spun off and is independent, all features are unchanged including the breakfast, it is now known as Premier Hotel and Suites. Phone 203 777 5337. An executive 2 bedroom runs $169 per night. When I called they had no internet reservation process or 800 number. I've booked there for Fri and Sat nights. Tickets: we can buy online, at yale.edu Prices run from $ 7 in the endzones to $ 30 around the 30 yard line. Either side (West = Home, East = Visitor) can be requested in the pricier seats. If we can get numbers together quickly, we can order a block of good seats. Matt died 4 years ago today. I have begun the transfer process away from Registerfly, as they have been worse than ever lately. I have now transfered off of their servers entirely. I will transfer to GoDaddy, which is uber-reliable. This site will be rewritten, but the site might have ads on it. But it will also have a working blog. I am sorry to report that I have accepted a job offer, thus ending my year-long experiment in self-employment. I had to do it; I hated my boss. Feb 28, 2007: Matt would have been 48 on March 1, and it's been now 4 years since we all got the call to come to New haven to say "goodbye". It seems to me that a lot has happened since then that I would have liked to complain to Matt about. This domain is registered with Registerfly, which continually messes up this page, but it's up again so I will not complain but update it quickly before it crashes again. Someday I will have to attend to what has become a messy site. Oh, I wish I had design skills. July 2006: It's now been three years since Matt died, and I've become lax about keeping the page up. Sorry. In the intervening time, we've lost Cindi Farr and, I'm told, Catherine Weston. Some information about Cindi is below. If you have more information about Catherine, please tell me and I'll put it here. Technical news: The new, improved Matt Hawley Network blog is DOA, and I am working on finding a more stable home for it. Meanwhile, if you feel like emailing, I am here at tim (at) kennedy.tv. I am still working on recovering the original Network postings from 2003, and will place them here when I get them. Registerfly has once again deleted all the photos, and I have once again managed to lose the backup. So a lot of them are gone, probably forever. What I have managed to find is now on Shutterfly. Also, Dennis Kammerer is AWOL, and his AOL address doesn't work. If you have a working email for him, please give it to me. If you would like to see anything else here, let me know. On April 18, I met Neil Howitt in Bath, UK. That's about an hour southwest of London. Neil was Matt's roommate at St. Paul's School, and he had found this site a few days after Matt's death. We had a pint in a nice pub around the corner from the restored Roman baths. I 've been a bit remiss in updating this page since Cindi left us. I've been to New Haven twice since (for a day each time) and the visit always brings me around to missing Matt again. I used to look forward to the trips, but it's not the same city without him there. I decided that Cindi should share this page. It would be so like Matt to share it. I'll look for a suitable picture. There is a quilting party to assemble the quilt that peple are making for Steve, Emily and Zander. Look here for details. I thought this a fitting place to repost this email from Steve Farr. These are the words Cindi spoke to her Mom and me shortly before she died Thursday, October 7th, much too soon and somewhat unexpectedly. Our hearts are broken, but the kids and I are doing okay. Cindi declined in recent weeks from the lung tumors, with pain in swallowing and in her back, so she was admitted to the hospital on Monday for pain management. Thursday morning she awakened with respiratory problems; obviously the tumors were affecting her airway, and her onconlogist was frank to say that her time left was short. Cindi thanked her for taking such good care of me even though it didnt work and told her how pretty she looked in a purple suit. Her Mom and I were with her for some good talk and hugging after that and, if you can imagine it, chatting wasnt easy for Cindi (I have so much I want to say and its so hard.). In her usual take-charge way, she managed to relay some wishes  most importantly that she see the kids soon. A good friend went to both schools and brought Emily and Zander to the hospital, so they had a brief and very loving visit. Cindi died shortly after her visit with the kids. She did not suffer, was at peace, and in control to the end (of course). She fought hard to stay with her family. Her friends, legions of them, helped her with the fight, bringing food and massage and good wishes for months on end. At Cool Aid on Labor Day weekend, we had a wonderful celebration with lots of those good friends. Cindi specifically asked that there be no sad funeral service but rather a celebration of her life with all the people that she loved. In that spirit, we are planning for a Celebration of Cindi on October 16th at 11:30 a.m. at Riverbend Farm (the site of Cool Aid) in Monkton, MD. See directions below. Very casual clothes and field-walking shoes are the order of the day. In the tradition of Cool Aid, we are asking people to bring a shareable dish for lunch. The Celebration will begin with an informal sharing of happy memories, stories, songs and other expressions of the love and joy Cindi brought to us all. Anyone and everyone is encouraged to participate in any manner that their spirit (or Cindis) moves you. We will then proceed to the consumption and communing phase. The Celebration will continue as long as people stay with us, and those so inclined are encouraged to join me through the night by setting up camp on the farm or reserving rooms in a nearby hotel. If you choose this option, bring something to toss on a grill or other dinner fare, and some coffee, bagels, hon-buns, bloody marys or the like for breakfast. PLEASE FORWARD THIS MESSAGE OR INFO ON THE CELEBRATION TO ANYONE WHO YOU THINK MIGHT BE INTERESTED. Please direct any questions to me by email or phone (301-570-2294). DIRECTIONS : Follow Baltimore Beltway (695) to I-83 North. Exit I-83 at Belfast Road (Exit 24). If you are coming south on 83, turn left onto Belfast Road; if you are coming north on 83, turn right onto Belfast Road. Take Belfast Road to York Road. Turn left onto York Road and go about 1.5 miles to Corbett Road. Turn right onto Corbett Road and go about 1.8 miles (through a stop sign, bearing right). Turn right into farm driveway -- there is a mailbox on the opposite (left) side of the road with "1449" on it. Cruise gently down driveway and follow signs to the parking area. Anyone with special needs may drive closer to the Celebration zone. Thanks for being such a good friend to Cindi and me. I look forward to keeping her love going with all of you. "It's been a tough year for me as I have been involved full-time in a coordinated and ongoing effort at getting an English teaching for Japanese learners site up and running and, in a burst of synchronous timing, have just today opened the site... kind of a cool memory of Matt and this time of year. The url is http://www.thisisapen.com"
The "Class of '81 Consortium" tailgate continued on November 22, 2003. We even had an official flag this year. Mladen sent along these pictures of the festivities. Bad News: I had a batch of 133 emails from late April through mid-June show up just last week. I would blame it on the ISP, but since I'm the board chair of the ISP, it's my fault anyway. Among the delinquent emails were a bunch of class-year corrections, so I am sure that some folk were listed in the YAM with a class other than that which they prefer. I'm sorry to all who were affected; I'll go through the emails later, and make personal apologies to those who were. Good News: I found a picture sent to me by Mark Hawley last summer. I like it so much I thought I would supplant the picture of Matt on the beach in the 80's, and thus morph him backwards almost 20 years. 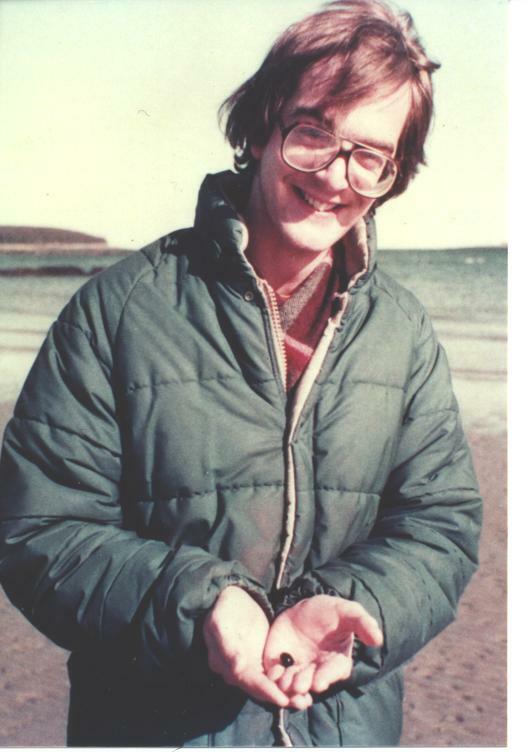 I am very sorry to report that Matthew Hawley (BK) died in New Haven on April 5 at home after a brave and uncomplaining battle with Hodgkin's disease, which was first diagnosed in 1987. This tribute comes from his friend, our classmate, Tim Kennedy. "Matt grew up around Washington, D.C. until he was sent to an English boarding school, from whence he came to Yale. Matt majored in Electrical Engineering. While he completed his degree, he was a computer programmer in the Yale/New Haven Hospital genetics laboratory. The hospital was good to Matt, as it accommodated him during those periods when he wasn't capable of much useful work. Throughout his long illness, Matthew traveled frequently to satisfy his fondness for music, friends and adventure. In the later stages, his loving siblings cared for him, and his friends called and visited him often. Those who met Matthew Hawley even only once were impressed with Matt's kindness, gentleness, and quiet intelligence. Matt was honest enough to tell hard truths, and kind enough for those truths to be accepted. In a world lacking sufficient grace and peace, he brimmed over with what matters most. Matt drew people to him magnetically, forming a single circle from the friends he made wherever he went. We who love him stayed together because of Matt. We pursued our individual bliss, and trusted Matthew to safeguard our collectivity. Matt was the keeper of contact information and the disseminator of personal news, holding us together across time and space. Merely to think of Matthew was to feel once more within that community. Occasionally, however, one had to go to the source. At Matthew's "Class of '81 Consortium" Yale/Harvard football tailgates, The Game was an afterthought. Matthew Hawley and the glad company assembled there were the real attraction. Matt lived his short life to the fullest. To him, the quality of the voyage was as important as the destination. Matt left us in the same way he lived with us, happily together. His many friends across the globe came to a farewell party in Branford on March 31 to say goodbye and to wish him a pleasant journey on his latest adventure. Pictures from the March 31 gathering can be viewed at www.matthawley.net. 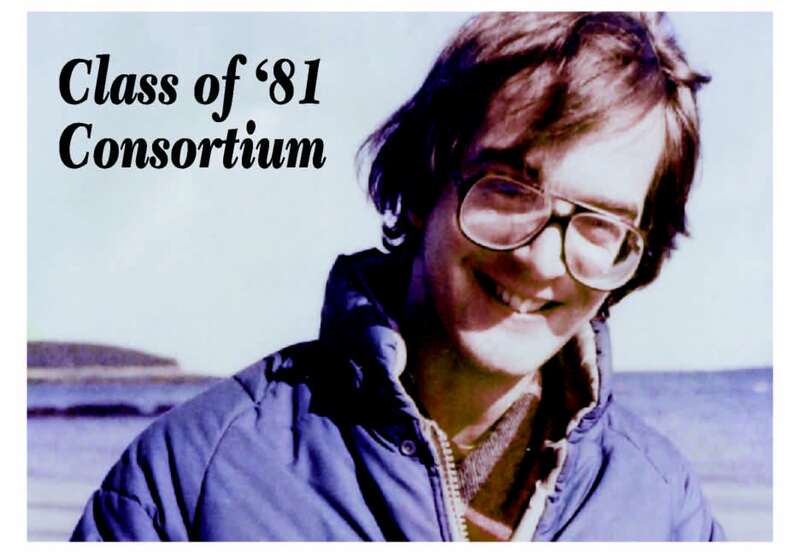 It was attended by the following members of 1981: Tim Kennedy, Mike Friend, Steve Farr, (Matt's sophomore roommates); and Heidi Hellring, Dave Buckley, David Steinberg, Eliza Gaynor Minden, To Benoit, Jonathan Knisley. From the class of 1982: John Minden, Linde Liu, Paul Hyland and Mary Hu. 1983: Julia Strohm, Suzanne Krick Greenawalt, John Greenawalt, Sandy Scott. 1984: Larry Pradell, Dennis Kammerer. 1985: Jim Signorelli , Tina Ingmann, Larry Pradell. 1988: Tim Hughes, Victor (Feinberg) Alfandre, Cathy Alfandre. Div School 2000 Juliana Thaens. Dave Sheperd 82? flew from California to see Matt three day earlier, and Mladen Palaic 1988 came later. Also attending on March 31 were two bartenders from Rudy's - Leo Vigue, Tom Hogan - and Bob Wilson, the bartender at Poco Loco, and originally from the class of 77. On May 17, we remembered Matt in a memorial service held at Berkeley College. Matt was predeceased by his mother but survived by his father, step-mother and four siblings - Nathan, Mark, Nan, and Monica." A Memorial Service was held for Matt on May 17th, 2003 in the Berkeley College Dining Hall. Here are some pictures of the event. Mladen's record of our "Quest for Fun" through the mean streets of New Haven following Matt's memorial service. These are some images of Matt taken in Jan., 1984 at my wedding in Minnesota. Matt was my best man. New Picture of Matt, presumably before skydiving. Linde Liu has sent her pictures of the party, as well.